Doug Evans, Source Interlink Media, V.P., has been named chairman of the “Save The Salt Coalition” formed to replenish the depleted salt at the storied Bonneville Salt Flats. Among the coalition members seeking ways to avoid and repair the deterioration caused by potasch mining next to the site are: SEMA, Southern California Timing Association, local racing associations and Source Interlink. Donald Trump, scheduled to drive the pace car. Shades of Eldon Palmer. And shades of Evil Knievel, a masked daredevil attempting a world-record four wheel vehicle jump the morning of the race. What race? Oh yes, what used to be all on its own the most famous and most watched single auto race in the world, The Indianapolis 500. In the past, sports writers spent what one of them, Deke Houlgate, called it the “year of May” in the Hoosier capital pumping out stories from every angle: driver’s diets, wardrobes, hobbies, and more, feeding the national interest in the race. …Maybe that is why National Speed Sport News shut down its press and today is online only (www.nationalspeedsportnews.com), catering to today’s audience that can’t wait. Instant results and on to the next diversion. Media registration is now open for the SEMA Show in Las Vegas, Nov. 4,2011. Check www.SEMAshow.com/register. . . . The Austin Texas Grand Prix race track, site for a Formula One race in the U.S in 2012, has been named “Circuit of America,” Steven Cole Smith reports in AutoWeek. Also, that the 20-turn, 3.4 mile track will host motorcycle races starting in 2013. . . . Auto Pacific’s periodic survey of its Vehicle Voce internet panel confirmed what has always been the case: American car buyers want better fuel efficiency but don’t want to drive smaller cars, SUVs or pickups. The research and consulting firm says the government will have a tough time artificially stimulating demand for smaller vehicles if car companies are going to meet looming fuel economy regulations. Gas prices, however, may do it. 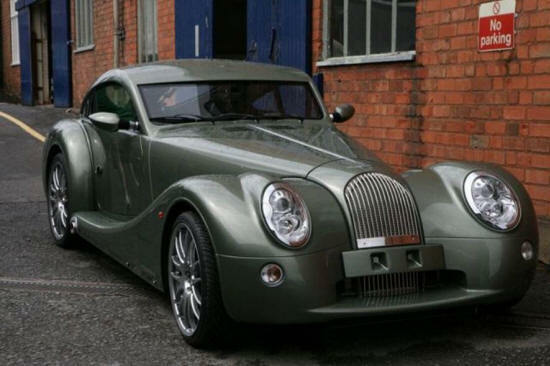 Hand crafted car by the Morgan Motor Company. Retro Formula 1 may not do the same for Great Britain’s economy but they are trying with a new, licensed, Cosworth DFV T-Shirt featuring the original blueprint of the DFV on the front with the back dedicated to the Formula constructors and drivers who won world championships with the iconic engine. For more information contact Andrew Smith at: Email: info@retroformula1.com, website: www.retroformula1.com. . . . The best and the worst of the 2011 cars as designated by the Center for Auto Safety are in the 31st edition of The Car Book. Journalists who would like a review copy can email Julia Redmon at Julia@jagilis.com or telephone her at 202-737-0766. . . . And, for those who would like to see how a handcrafted car is built, click here for a series of photos with brief text, that shows how the Morgan Motor Company has been doing it pretty much the same way as it did when it started 100 years ago. GM & Barra: Shrewd Reverse Sexism?